Damon's Design HW, black Oldenburg gelding by Damon Hill/Florencio born in 2010, standing approximately 171 cm or 16.3 hands. His pedigree is super impressive, his sire Damon Hill was a premium stallion and performance test winner in 2002. He received high marks at the Bundeschampionate in 2003 in Warendorf. 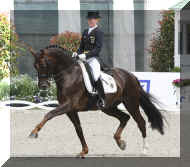 In 2005 Damon Hill won the qualifying round and the World Championship for young dressage horses. His scores were: walk 9.2, trot 9.80, and canter 9.2. Damon Hill prolonged his reign in 2006 when he lived up to all expectations. The stunning stallion with power and balance captured the 2006 World Breeding Championship for young dressage horses in Verden Germany again with scores in the 9.0's. At the age of 12, the remarkable Westphalian stallion, Damon Hill FRH is taking the world by storm. With a record breaking win in Balve, Germany at the German National Championships, Damon Hill FRH and Helen Langehanenberg have established themselves as the new leaders in German dressage. The pair took home two golds from Balve scoring a remarkable 88.400% in the Kur, and were named to the Olympic German Team. In London, they brought home team silver, and placed 4th being only .03% away from the individual bronze medal! Damon Hill was a premium stallion and performance test winner in 2002. Early in his career, he received high marks at the Bundeschampionate in 2003, was the bronze medalist at the 2004 Bundeschampionate, and in 2005 Damon Hill won the World Championship for the 5 year old Dressage Horses under Helen Langehanenberg who took over riding him from an injured Ingrid Klimke. His scores were: walk 9.2, trot 9.80, and canter 9.2. Damon Hill prolonged his reign in 2006 when he lived up to all expectations back under Ingrid herself. The stunning stallion with power and balance captured the 2006 World Breeding Championship for young dressage horses in Verden Germany again with scores in the 9.0?s. With his excellent character and great impression he wins the hearts of everyone he meets. Along with his "day job" as a Grand Prix dressage horse, he is also a breeding stallion in high demand. He captivates through his extraordinary ability, and convinces with his work ethic and desire to please. At the age of seven, he often won S-Dressage competitions and at eight years old, he finished second in the Nürnberger Burg-Pokal. At nine, he won many Grand Prix tests and was second at the Medien Cup Final in Munster at the Turnier der Sieger. With his excellent character and great impression he wins the hearts of everyone he meets. Along with his "day job" as a Grand Prix dressage horse, he is also a breeding stallion in high demand. He captivates through his extraordinary ability, and convinces with his work ethic and desire to please. Dami enjoys the days when he can do his dressage training outdoors on the hills and has a lot of fun with the gymnastic jumping. Quote Ingrid Klimke: "It gives great pleasure to train such a talented horse"
WC of the 5-year-old dressage horses in Verden/Florencio wins with a record-breaking score. 10.0 points for the canter, 9.8 for the walk, 9.7 for the trot, 9.6 for the suppleness, and 9.9 points for the overall impression. Astronomical results for a stallion which seems to be from a different sphere: Florencio wins the World Championship of the 5-year-old dressage horses. With the total score of 9.80, the dark bay Westphalian under his Dutch rider Hans Peter Minderhoud established a new championship record. Already during the qualification round Florencio proofed his exceptional quality. Unimpressed with the downpours and the heavy ground of the test arena, he won confidently achieving 9.8 points each for the trot and for the canter, 9.5 for the walk as well as for the suppleness, and 9.7 for the overall impression which added up to a total score of 9.66. In the final test, the sire from Ludwig Kathmann's stallion station in Vechta-Holtrup did his role as the favorite candidate justice. Despite the strong wind which was blowing in the stadium in Verden, the young stallion concentrated exemplarily on the aids of his rider. The expressive trot, the picture-perfect canter as well as the rhythmic, ground-covering and calm walk impressed both the audience and the judges. The comment of judge Jenny Loriston-Clark from Great Britain brought it to the point: "What a wonderful horse." Last year Florencio won the Westphalian Championship under Simon Drop, and at the German Championship in Warendorf he became vice-champion of the 4-year-old stallions. Susanne Sanal from Kamen bred the Florestan I-son Florencio out of Walessa by Weltmeyer-Pik Bube I. Florencio was approved by the Oldenburg breeding association. Six of the foals from his first foal age class have been admitted so far for the 3rd Elite Foal Auction in Vechta on the 20th August 2004 at the Oldenburg Horse Centre in Vechta. He debuted as a sire at the 60th Oldenburg Elite Auction in April 2004: At that event a Florencio-son was sold for 10,000 Euros to Great Britain. Florencio is undoubtedly a great gain for the dressage breeding. His unbelievable beauty in conjunction with his natural light, uphill movements makes him a revelation to every dressage lover. Florencio is a stallion who is bred for dressage from the cream of the crop of stud stallions in Westphalia and Hanoverian studbooks. He carries with him all the blood and expression necessary for dressage breeding. 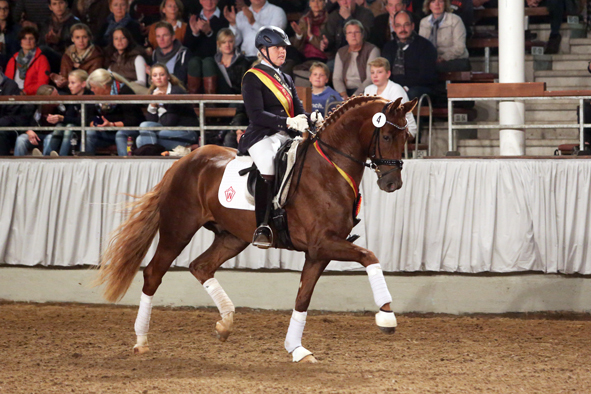 His sire Florestan I is the outstanding dressage ambassador of the westphalian studbook. Florestan I has several approved sons such as Fidermark,Fleurop, Fuerst Heinrich, Faveur, Flores, Freestyle and Flieder. Florencio's grandsire Weltmeyer is one of the most famous stud stallions in Hannover with countless approved sons and offspring in the dressage sport. He has sired over 88 graded sons. His 'Hall of Fame' features outstanding sons like Wall Street, Weltburger, Wee Weltmeyer, Weserperle S, Wesley, Wolkenkranz and the full brothers Welt Hit I 0, II, III, IV, V, and six VI. Weltmeyer's sire World Cup I, full brother to White Foot's sire World Cup III, sired sixteen graded stallions including Walt Disney I, Walt Disney II, and Warkant. His international dressage portfolio includes Welcome, Without A Doubt, Watusi, and Walzerkoenig. Progeny have accumulated winnings in excess of £310,000. Further into Florencio's pedigree we also encounter the famous dressage progenitor Pik Bube . Pik Bube , was a very successful dressage stallion and a top sire of breeding, dressage and sport horses including 30 graded sons of which International competitors Pikant, Plaisir d'Amour 002, Paddy and Pik Primaire are some of the most successful. All in all, the dressage genes are firmly anchored in Florencio. Damon's Design HW is a horse in definite Champion quality and is equipped absolutely phenomenal gaits. He impresses with 100% rideability, character and very strong nerves. His stallion type (he is a gelding!!) will mesmerize everybody alike and he is dressed in a beautiful pitch black coat. He looks like a clone to his sire Damon Hill. He is a horse who casts his spell on every single person, he was born to step in his father's footsteps. He is a super fancy mover who knows to impress due to his type, movement and work ethic. This stunning horse has all the looks and the personality a person could ever hope for. He has a super nice, chiseled head, big stallion neck (he's a gelding! ), if he blinks with his beautiful kind eye, you'll fall in love at first sight. He just puts a spell on you. This horse has cat like movement, he's as elastic as they get. His hooves barley touch the ground. He loves to please his handler and rider, to learn new things is his hobby. He eagerly works under saddle. He is all concentrated on his job in the dressage arena and with his quick, far reaching hind leg, passage and piaffe will come naturally to him. He was ridden inside and outside and doesn't mind heavy farm equipment being driven around him during his work session. He is supple and has a ton of air time. He just floats above the ground. With his free shoulder and huge grundschwung, he swings nicely through his back. He is light in the bridle and easy to sit. This extremely talented gentleman has definite international potential. He is a very sweet boy, very rideable and trustworthy. He is easy to handle and loves his personal grooming time and puts his head right in your lap, striving for attention and searching for treats. Damon's Design HW is uncomplicated on the ground and under saddle. 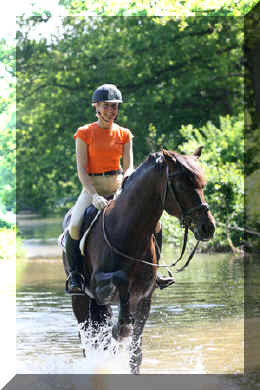 He is easy and uncomplicated to ride and an amateur, YR or professional will enjoy him just the same. You just can't beat his personality, gaits, looks and temperament. This young stunner will go far in the dressage ring, he is your ticket to the top! With this horse, you will be the star in FEI classes and at clinics, the judges and onlookers will remember him where ever he goes. The 2013 Bundeschampion Damon's Dream achieved the top knock down price at the 2013 Westphalian Autumn Elite Auction in Munster-Handorf on Sunday 6 October 2013. The liver chestnut and spectacularly moving gelding by Damon Hill x Furst Heinrich sold for Euro 270,000 (plus auction commission, plus tax & insurance x exchange rate, roughly US $ 500.000!) to a local dressage enthusiast. Sandra Frieling and Damon's Dream scored 10 for trot and 9.5 for canter to win the 2013 Bundeschampionate. Damon Hill and Florencio are top producers and they are known for their superb and flashy movement, ride ability , temperament and brain. Good characters are a must for any horse. Damon's Design HW, is exemplary to this rule! He is used to go in the hot walker, loves his shower and solarium time. Stands for the farrier, loads and appreciates grooming time. Damon's Design HW is as sweet as a puppy dog, but with the attitude of a real gentleman. 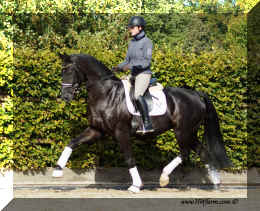 This boy will go far in the dressage ring, he is your ticket to the top. Buy him now and show him yourself in the Young Horse Championships or take him to the BundesChampionships.